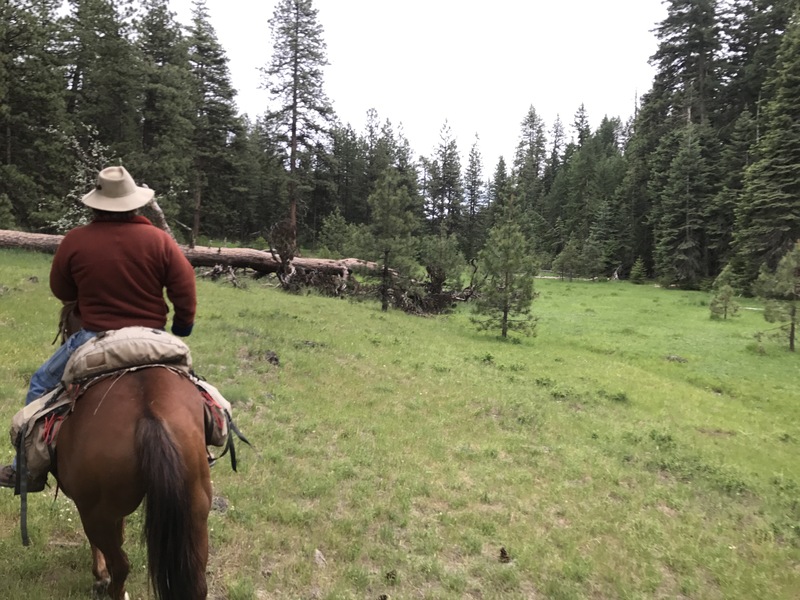 Soda Mountain Wilderness Council Executive Director Dave Willis rides his horse Chance through a meadow in the Cascade-Siskiyou National Monument. (CN) — Dave Willis rides a mid-size gelding named Chance through towering firs interspersed with ponderosa and lodgepole pine as spruce and hemlock hover over a forest floor covered with Jurassic fern. As the executive director of the Soda Mountain Wilderness Council navigates through the southern reaches of the Cascade Range, lichen hang from the branches of the coniferous trees, swaying in the wind. At mid-June, the wildflower bloom is nearing its peak. The weather forecasters called for afternoon thunderstorms, but the rain has stayed away all day, and the forest is awash in quiet except for wood snapping under the horse’s hooves. 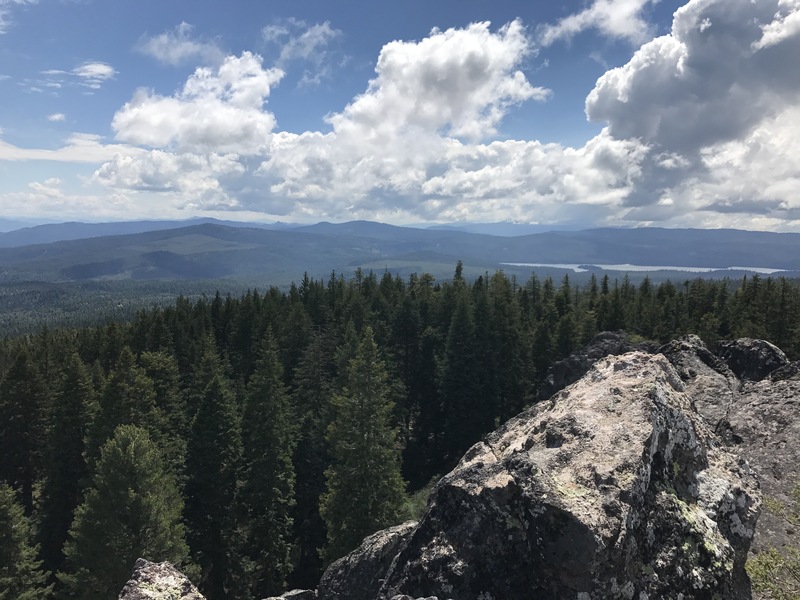 This forest is intact, retaining the character it’s maintained for centuries, because of the conservation endeavors of Willis, his organization and the many allies that contributed to the effort to create and expand the Cascade-Siskiyou National Monument. The monument straddles the California/Oregon border, encompassing roughly 87,000 acres of forest, grassland and mountain peaks in the region where the Cascade Range collides with the geologically distinct Siskiyou Mountains. 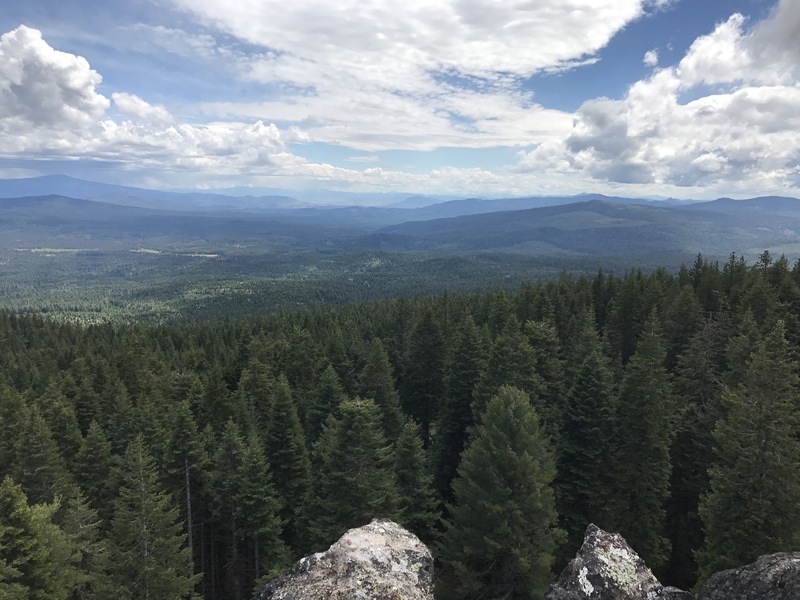 “This is the only monument established for the sole purpose of preserving biodiversity,” said Shannon Browne, the community-partnerships director for the Friends of the Cascade-Siskiyou National Monument and a proponent of preserving the monument’s current borders. The monument was established because the area represents an intersection of several different biological zones. On its eastern fringe, a portion of the Klamath Basin hosts the same array of vegetation – including sagebrush and juniper – found elsewhere in the Great Basin that covers territory spanning Utah, Nevada, Idaho, California and Oregon. To the south, the Siskiyou Mountains, an approximately 100-mile coastal mountain range that begins at Crescent City, California, has its terminus at the monument. The range brings its own mix of flora and fauna, including coastal Douglas fir, California white fir, Lawson’s cypress and the distinctive weeping spruce, as well as the endangered Siskiyou Mountains salamander. “It’s the most botanically diverse coniferous forest in North America, if not the world,” Willis said. Willis said the monument not only preserves biodiversity but provides regional connectivity. Ecologists who worked with federal land management agencies such as the Bureau of Land Management first recognized the significance of the area in the early 1980s. That was when Willis became involved in advocacy for the preservation of the area that is now the monument, although the first push was to get a “wilderness area” designation, which carries much stricter development prohibitions than monument status does. Willis got his wish in 2009, when former President Barack Obama designated a 24,000-acre swath inside the monument as the Soda Mountain Wilderness, making any type of development on those lands forbidden. But this designation highlights the complicated land-use picture inside the monument, which is as diverse in its own way as the biodiversity of the territory it aims to protect. Former President Bill Clinton originally designated 38,774 acres, all of which was in Oregon, as the original Cascade-Siskiyou National Monument in 2000, months before relinquishing the Oval Office to George W. Bush. The Soda Mountain Wilderness designation came as part of an omnibus bill in 2009, signed by Obama. Obama also expanded the national monument by 48,000 acres – including about 5,000 acres of Northern California – on Jan. 12 of this year. Current President Donald Trump took office eight days later. A view of the newly expanded Cascade-Siskiyou National Monument. Most of the land shown to the right is O&C Land and is disputed by timber companies and an association of Oregon counties. To the left, forests depleted by timber production are visible. Not only was the designation of the monument done piecemeal, but the land inside the monument is comprised of public lands managed by the BLM and private lands held by timber companies for the purpose of harvest, cattle ranchers and other private citizens. Within this vortex of users, interests often conflict. Further complicating the picture, the 48,000-acre expansion included about 40,000 acres of Oregon and California Railroad Revested Lands, commonly known as O&C Lands. O&C Lands comprise about 2.6 million acres of land in western Oregon that were ceded to the owners of the Oregon California Railroad in 1916 for the purpose of building a railway between San Francisco, California, and Portland, Oregon. The BLM now manages much of that land, which spans 18 counties. In 1937, the United States Congress passed the O&C Act, which directed the BLM to harvest timber on the lands and to use the proceeds to fund various programs – such as education – in the counties. Using timber as a funding mechanism has recently encountered some turbulence, however, as concerns about environmental degradation, habitats for endangered species such as the spotted owl and the preservation of old-growth forests have slashed proceeds from timber sales to a mere fraction of what they were at their peak in 1989, bringing in $1.5 billion annually. The timber industry and county officials that depend on those proceeds to fund schools, law enforcement and other social services view Obama’s decision to expand the monument as yet another encroachment on the region’s economic viability. This tension has fueled lawsuits filed by three different entities in various federal court jurisdictions, all centering on the legality of Obama’s expansion of the monument. 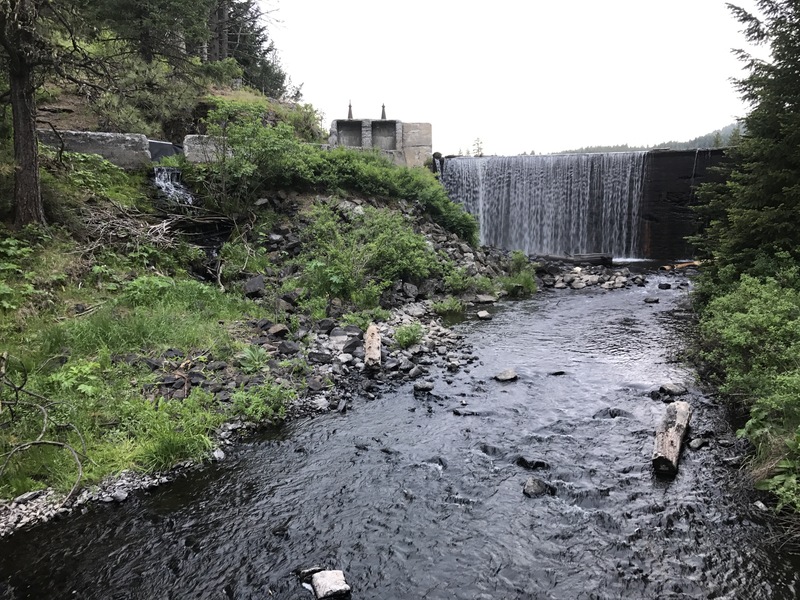 The American Forest Resource Council and the Association of O&C Counties both filed suit in the District Court for the District of Columbia; Murphy Timber, which owns swathes of private land in the monument, filed suit in Oregon’s federal court. All three lawsuits have been stayed after Secretary of the Department of Interior Ryan Zinke announced he would review whether the expansion and designation of the Cascade-Siskiyou National Monument was done in concert with the law and the full input of all stakeholders. A waterfall flows in the Cascade-Siskiyou National Monument. All three organizations say the restrictions on timber production on federal lands in Oregon has had disastrous consequences for the local economy. Moreover, Fite said the timber industry is interested in productive and healthy forest management, noting that a hands-off style includes fire-suppression tactics that lead to catastrophic wildfires, infestations of pests like the bark beetle and forests more susceptible to drought. “It leads to conditions that are quite unhealthy and even dangerous,” he said. 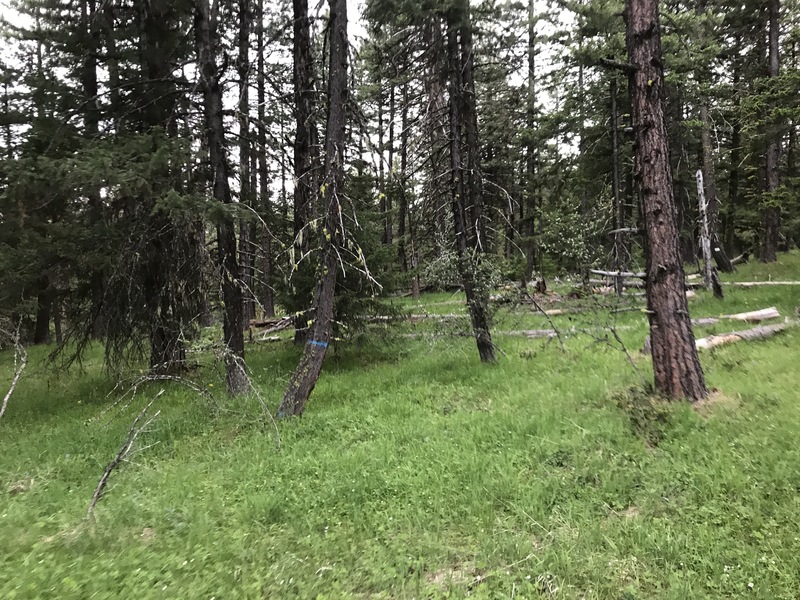 This stretch of forest lies within the Cascade-Siskiyou National Monument, but it is owned by a private timber company that has harvested many of the large trees on the property. Willis contends this is just empty corporate shibboleth that the timber industry has been spouting for years. He says he has taken hundreds of interested parties on horseback rides through the pristine remnant forests to show them the stately pines draped in light green lichen framing sun-sapped meadows. He invites the riders to compare the scene before them to areas of the forest that have been clear-cut. 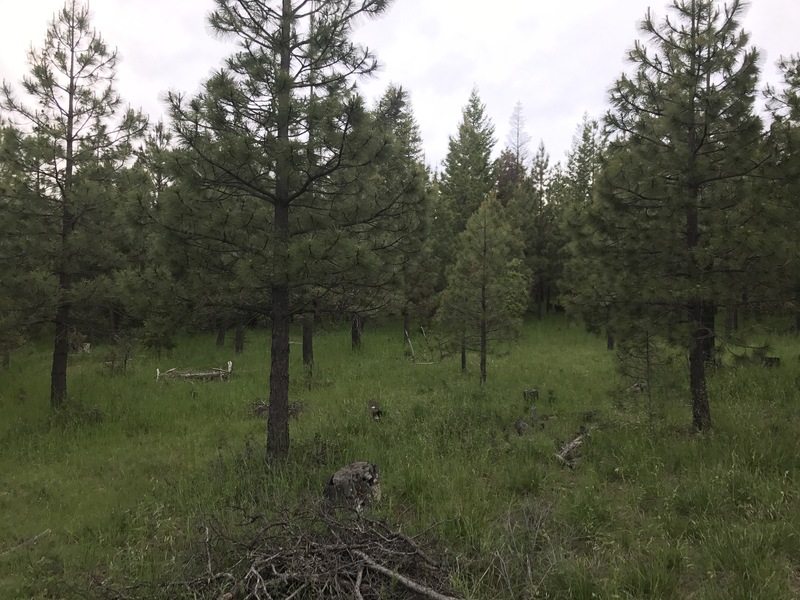 Even where the timber industry has avoided clear-cutting and has instead taken 40 percent or 60 percent of the trees, as mandated by BLM management plans, the forests are starkly different from their natural state, Willis said. He also noted that 24,000 of the 40,000 O&C acres have been designated as preserved for recreation, meaning those forests couldn’t be harvested for timber anyway. That leaves only 16,000 acres of potential timber harvest that were set aside by Obama. Browne said opponents to the monument have propagated a lot of misinformation, such as telling hunters they will no longer have access to the land and worrying property owners that onerous restrictions will be imposed on their private property. Willis said these and other myths about the import of a monument designation are simply untrue. “If I believed half of the things opponents said about the monument, even I would be against it,” he said. Both Willis and Browne said that despite half-truths and misleading information, public enthusiasm for the monument has been overwhelming, with supportive comments outweighing opposing ones nearly 4 to 1 at many of the public scoping sessions. Furthermore, Native American tribes – many of whom have ancestral ties to the lands – back the expansion, as Don Gentry, Chairman of the Klamath Tribes, noted in a letter to Oregon Senator Jeff Merkley. Merkley, Senator Ron Wyden and Oregon Governor Kate Brown have all come down in support of the monument expansion, as have the city councils of the nearest two towns – Ashland, Oregon, and Talent, Oregon. “There is huge public support for this monument from the local communities and state,” said Kristen Boyles, an Earthjustice attorney who is defending the national monument cases. Boyles said that the plaintiffs’ legal argument hinges not only on whether the U.S. President can use the Antiquities Act to trump an act of Congress, which she believes is legal, but also whether the designation of O&C lands as strictly for timber production will hold up to court review. Unsurprisingly, she is confident it will not. According to her, those lands were always meant for a variety of uses, not simply timber production. In fact, she does not believe the current review process undertaken by Zinke should apply to the Cascade-Siskiyou National Monument at all because of the extensive public process that took place before the designation, coupled with widespread public support by those in proximity to the lands. “This monument doesn’t fit the pattern of the DOI review, and yet here we are because of one industry that has a very narrow view of how federal lands should be managed,” Boyles said. An overlook affords a spectacular overview of the Cascade Siskiyou National Monument. Courthouse News has been providing in-depth features on some of the national monuments targeted for closure or reduction by the Trump administration, including the Hanford Reach National Monument in Washington, The Upper Missouri River Breaks National Monument in Montana, and the Papahanaumokuakea Marine National Monument in Hawaii. Click here for more CNS coverage on national monuments.